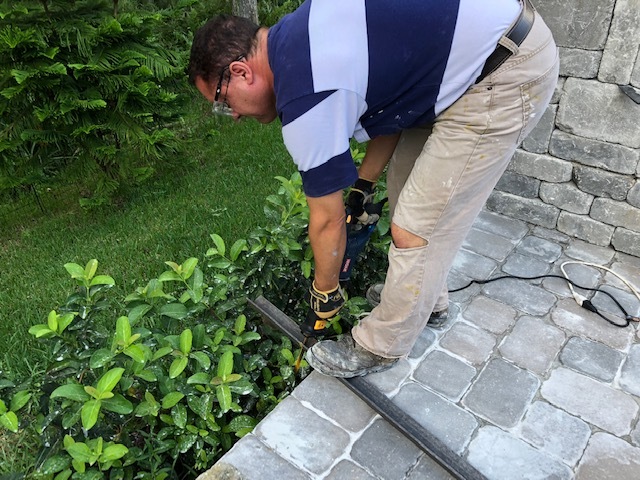 As you've read from previous posts, my husband and I are both fairly handy guys who enjoy tackling projects that are typically quite expensive when contracting. Regarding our DIY projects, we really only have one rule: we won't undertake big projects unless there is potential for strong ROI at re-sale...we've always held to this belief. As a Realtor, this general principle has become a guiding rule for me & my family. The latest project is a wood burning fireplace with two bins to hold logs. Inman Select is stating an outdoor fireplace will result in 100% to 200% ROI, depending on the climate. 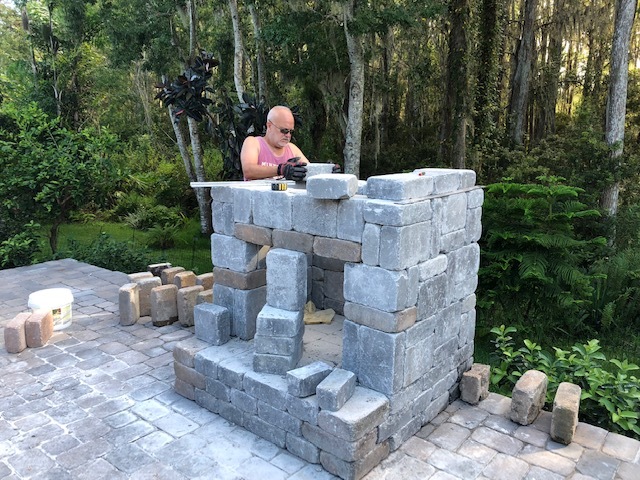 For example, dropping $10,000 on an outdoor fireplace will result in higher ROI in Florida, California, Texas, Arizona, etc., compared to Minnesota. Personally, I find their claim dubious and too broad, but let's say that every dollar spent, in Orlando, will be returned at resale, which is 100% ROI...their low-end estimate. Additionally, it will also add to the desirability of the property (at resale) by having outdoor living space and beautiful features. Our fireplace and wood bins is similar to one that can be purchased online in a pre-cut kit from RomanStone for $4,675, which includes delivery. As with most projects, if you need to hire someone estimate the labor cost the same as material cost, which in this instance the online kit cost x 2, which is $9,350. Perhaps you'll find a contractor who'll do it for less, or more, depending on your situation and the local skilled labor market at any given moment. As of 10/1/18, Orlando is experiencing a skilled labor shortage. 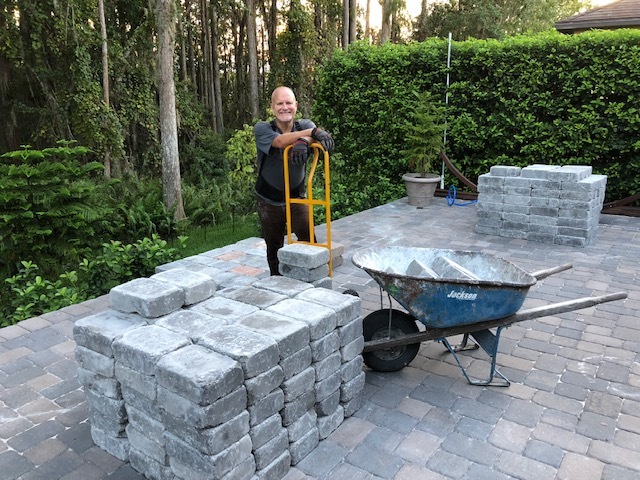 Since we know the manufacturer in Orlando producing similar stones, we went directly to the source and bought our own, which cost $1,350 for the stones and delivery to the driveway...we had to haul the stone to the backyard. The final costs will be tallied and presented when finished. At this point, since this is something we've never done before, we are estimating another $300 to $400 for concrete adhesive, tool rental, metal supports, mantel, concrete, stain, firebrick, etc. You will need the following: square, large and small levels, plumb line, concrete saw, saws-all, hand held circular saw, rubber mallet, caulk gun, pencils, knife, tape measure, wheelbarrow/hand cart, concrete mixing tools and shims. 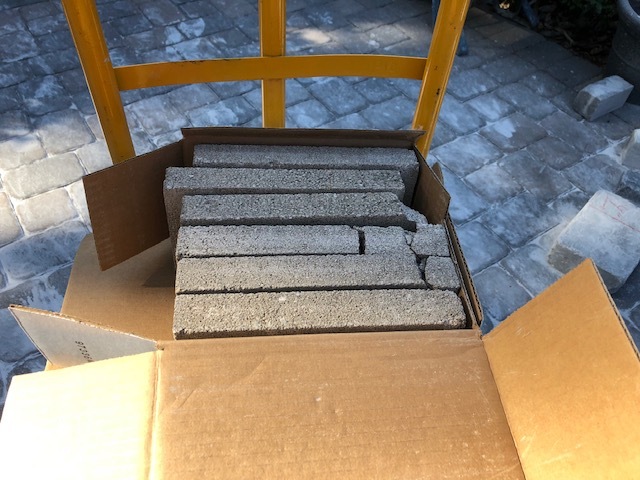 The stones were delivered to our driveway, so we had to haul to the terrace. Have the tools and back supports...safety first. 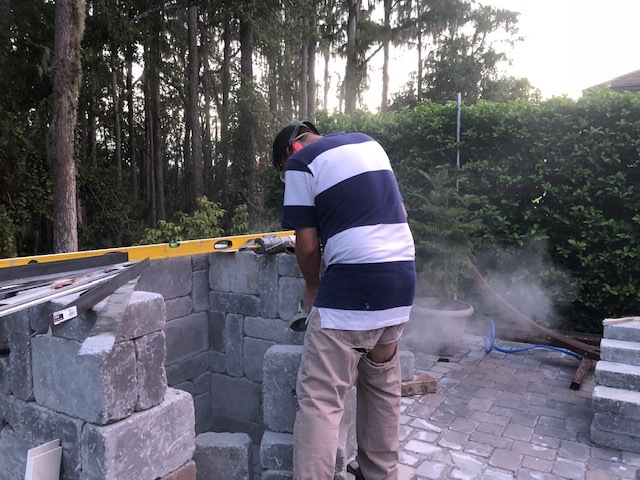 Roberto is cutting the lintel stones with a rented masonry saw from Home Depot. We had to fabricate many stones, such as: lintels, capstones and irregular fireplace stones. Roberto is cutting the angle iron and additional iron supports for the firebox opening. This step is critical since stable support is required to go vertical with the firebox and chimney. Below. We have built the opening structure and are using support stones while the concrete adhesive sets. 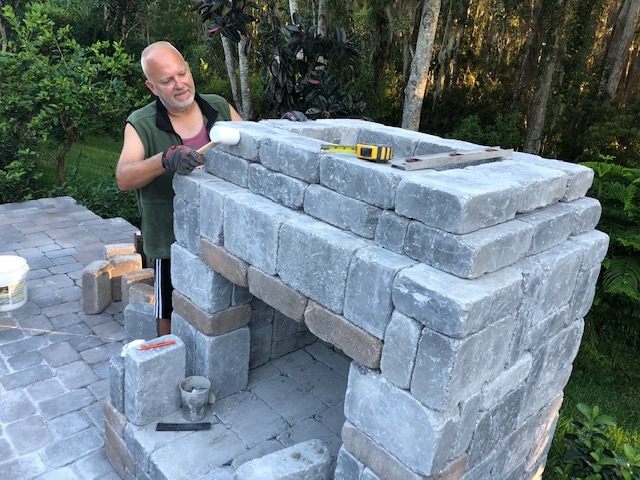 I am placing the stones which will have the fireplace go vertical while tapering the chimney to ensure proper airflow and draft. The support stones for the firebox have been removed and now we continue building the chimney. The rubber mallet is needed to make sure area is level and plumb...essential for stability and proper airflow draft. 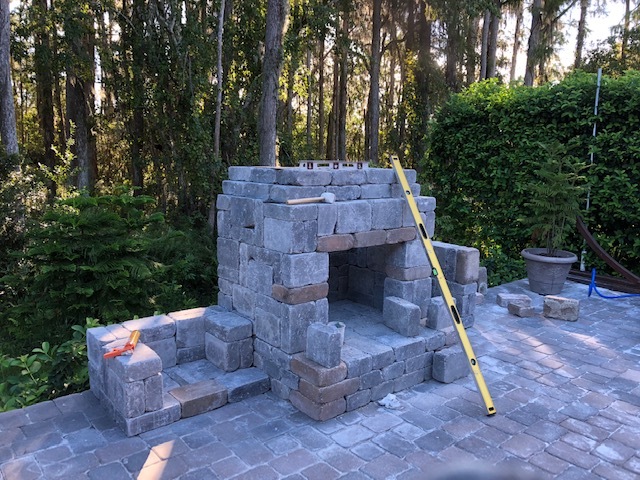 This is the firebrick, which was a special order from Northern Tool and delivered to their Sandlake location in S. Orlando. Firebrick is used to line the walls of the box as well as the box floor. We could not find it locally, which is why it was ordered online and delivered directly to the store. For $180 dollars it would've been delivered directly to our house, but that is excessive, in my opinion. The brick is somewhat fragile, so be careful. We had several boxes with damaged brick. While Roberto was out of town we decided to stop the project since it really is a two person endeavor. I surprised him by building the attached wood bins. We are using remaining beige stones (from an earlier project) which show their age with a dingy film, which I'll power wash later. The slope of the terrace (for rain water drainage) means the boxes (and fireplace) need to be leveled to compensate for the slope. A large level and concrete was used to maintain a level and plumb structure. Half way there! We already had approx. 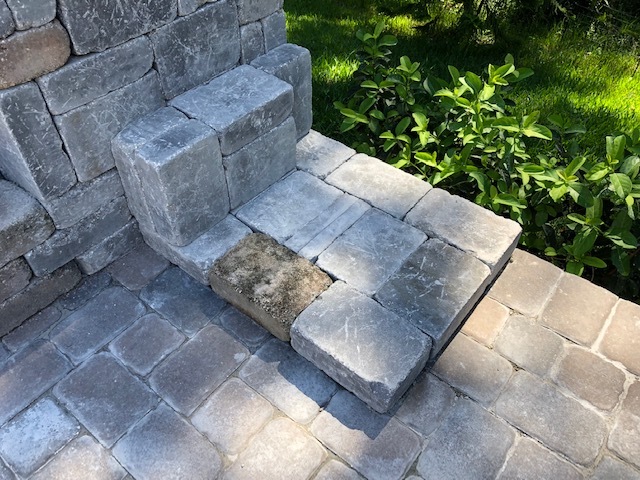 34 of the tan stones piled in our yard from a outdoor kitchen project, so we decided to incorporate them into the final design to add visual interest and soften the slate colored stone as well as adding continuity between the two spaces. The right wood bin is built and the left side is 3/4 finished. He was happily surprised when returning home! !